Vera LeRay Warner is the daughter of a United States Navy veteran, the granddaughter of both United States Air Force and United States Coast Guard veterans and is married to a United States Army veteran. She is also a veteran of the United States Air Force. Having such a rich military ancestry instilled in her a sense of adventure at a very early age that caused her to develop an almost insatiable desire for reading. As a youngster she would take the city bus downtown to the public library and come home with an arm load of books and would have every one of them read before they were due to be turned back in. 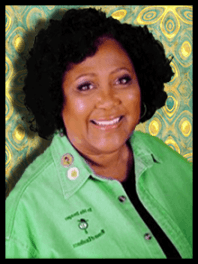 Upon graduation from high school she joined the United States Air Force and it was during her tour that lasted almost 12 years that she first began to write poems and short stories mainly in celebration of African American History month. She enrolled in the Community College of the Air Force, and the University of Maryland where she earned Associate degrees all the while writing as a hobby. The time finally came when she made a decision to pursue her education full time so she enrolled at Wayland Baptist University and eventually earned her bachelors in Christian Education and later went back to school and earned her Masters in Theology. There were many twists and turns in her life but her greatest accomplishment was November 1984 when she surrendered her heart to the Lord Jesus Christ and became a Christian. It was also during 1984 that she was selected and listed in the 1984 edition of “Outstanding Young Women in America.” From that time onward she went back to her writing but it was not until 2000 that her first literary work was published: Creatively Reaping the Harvest: Using the Tea as an Outreach Ministry. Vera has since authored Embracing the Love of the Father, Cultivate My Heart and The Making. She was also a contributing author for Speak to Me Lord Inspirational Writings by Women for Women Volume 1. Her bible study books are currently being used for small group studies in the United States, the United Kingdom and Germany. Vera and her husband Michael, currently make their home in South Carolina where they get to spend time with their grown children and grandchildren.